Yes, you read it correctly. We are speaking about the Native Cross-platform Mobile App Development. 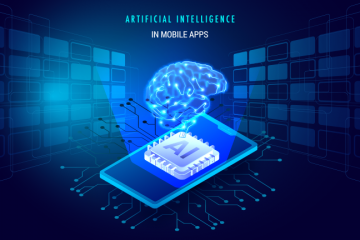 Now, you do not need to bang your head in determining whether to opt for Native or for cross-platform mobile app development. What you need is a consolidation of both in one mobile app offering duel benefits. 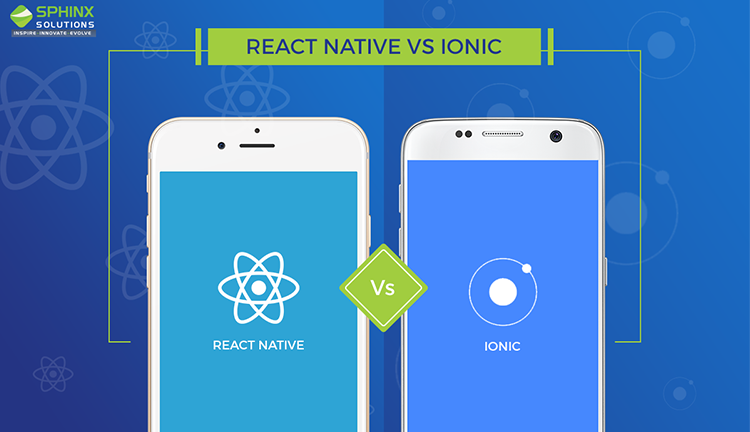 In this blog, we will compare the top two cross-platform mobile app development frameworks – React Native and Ionic. We will evaluate them on various specifications and try to find out specialties, limitations, and scope of these frameworks. 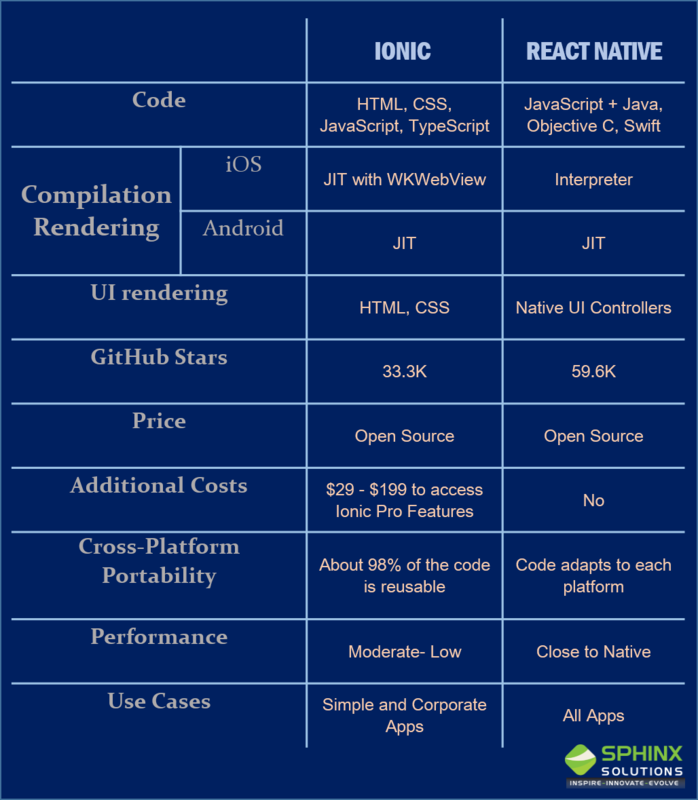 One of the strongest points making React Native the widely used and widely preferred cross-platform app development framework is because it allows developers to write modules in Objective-C, Swift, or Java Language whenever they need. Additionally, due to the native modules and libraries to React Native Apps, it becomes easier to handle computationally heavy programs like image editing or video processing. As Ionic uses web technologies for rendering purposes, it reduces the speed so the application built with Ionic fails to mimic native-like app performance. Additionally, no use of native components is possible in Ionic so native behavior can be recreated. 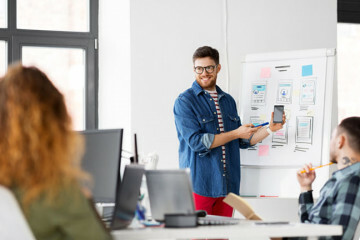 Ionic Developers need a native Wrapper Cordova for connecting the mobile app with the native APIs, so it could adapt the behavior of the underlying operating system. Fast testing and consistently running in a browser are probably the most elegant features of Ionic. Nevertheless, many pre-made and pre-styled components help in streamlining the overall mobile app development lifecycle. Ionic uses JIT compilation for Android and a default platform browser – WKWebView for iOS. The bottom line, it is impossible for React Native to achieve performance that could be achieved by the complex and rich applications developed using React Native. React native is able to offer app users experience equivalent to native because of its modules interacting directly with native Android and iOS controllers. In addition to that, the capability of React Native to utilize React.JS Library with extensive UI components further helps in streamlining the process of User Interface Development. Thus, React Native developers get to work faster as they have access to a divergent bundle of UI components like buttons, modules, and sliders. Ionic renders everything through HTML, CSS without interacting with any of the native controllers. However, it applied Cordova, which then helps in imitating the native-like mobile behavior. Additionally, the components in AngularJS bundled together in the framework further help Ionic in making it look like the native. The recent edition of Ionic comes with a pre-embedded UI element that was absent before on the web but was available only with Native SDKs on iOS and Android platforms. React Native is the most starred framework on Github. It has 59.8 thousand stars. 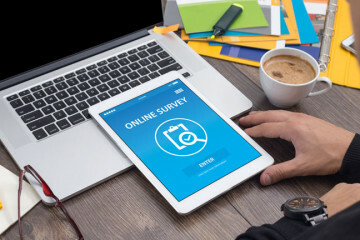 Recently, StackOverflow technology overview confirmed that the React Native is the most loved and widely used cross-platform mobile app development framework. As the React Native developer community is growing rapidly, the number of experienced engineers is also growing at the same speed. By being a part of this growing global community, a React Native developer can easily find answers to his questions and can easily get access to a huge number of third-party libraries created by the community members. The online Ionic community is growing steadily since it has been launched and the 2017 Ionic Developer Survey exemplifies that about 80% of the developers in the community are experienced. A dedicated Q&A forum is the specialty of the Ionic community that helps new developers to ask their queries as questions and in response get answers or advice. Apart from that, it boasts a ‘Slack Channel’ representing Slack community for Ionic developers all over the world to interact and collaborate. Ionic is also an open source program at the time of registering and commencing development. However, it has a companion platform called Ionic Pro offered in three variants – Developers, Teams, and Businesses. The package is available at a monthly subscription ranging from $29 to $199 and offers more days to track error history along with collaboration tools making it easier to manage Ionic development taking place at a larger scale with numerous teams. What framework you will be using to build your mobile app is a matter of personal preference and convenience. Subsequently, your team, developers, and user requirements matter a lot while taking a decision. Remember, both – React Native and Ionic have different specialties to do different things, but believe it whatever they are doing, both frameworks do it perfectly right. 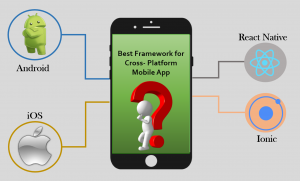 Of course, the best advice would be to test each of these frameworks and decide the appropriate one suitable to develop your cross-platform mobile app. We are a leading cross-platform mobile app development company with a team of highly experienced and skilled React Native and Ionic developers ready to develop a cross-platform mobile app in your chosen framework. Contact us, If you need any assistance in Ionic or React Native Cross-platform mobile app development.